50 mM Sodium Phosphate pH 7.5, 100 mM Potassium Chloride, 150mM NaCl, 5% Glycerol, 0.2% BSA. Five x 10A5 cultured Raji cells were washed and incubated 45 minutes on ice with 80 ul of anti-CD62L/FITC at a 1:50 dilution factor (10 ug/ml). Cells were washed three times, fixed and analyzed by FACS. Cells stained positive with a mean shift of 1.24 log10 fluorescent units when compared to a Mouse IgG2a/FITC negative control at a similar concentration. Binding was blocked when cells were pre incubated 10 minutes with 20 ul of 0.5 mg/ml anti-CD62L antibody. Protein A purified antibody from tissue culture supernatant was reacted with FITC. Unconjugated FITC was separated from antibody/FITC conjugate by desalting column. The antibody/FITC conjugate is at 0.5 mg/ml with a Fluorescein: antibody molar ratio of 13.8. 50 mM Sodium Phosphate pH 7.5, 100 mM Potassium Chloride, 150mM NaCl, 5% Glycerol, 0.2% BSA, 0.04% NaN3 (as a preservative). Five x 105 cultured Raji cells were washed and incubated 45 minutes on ice with 80 ul of anti-D62L/FITC t a 1:50 dilution factor (10 ug/ml). Cells were washed three times, fixed and analyzed by FACS. Cells stained positive with a mean shift of 1.24 log10 fluorescent units when compared to a Mouse gG2a/FITC negative control (Catalog #MBS666101) at a similar concentration. 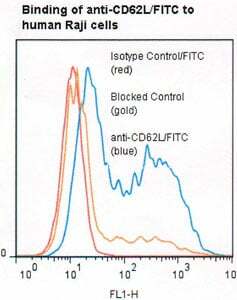 Binding was blocked hen cells were pre incubated 10 minutes with 20 ul of 0.5 mg/ml anti-CD62L antibody . Store at 2 - 5°C. Freeze/Thawing is not recommended. Protect from light. Small volumes of anti-CD62L antibody vial(s) may occasionally become entrapped in the seal of the product vial during shipment and storage. If necessary, briefly centrifuge the vial on a tabletop centrifuge to dislodge any liquid in the container`s cap. Certain products may require to ship with dry ice and additional dry ice fee may apply. Human CD62L is as adhesion molecule found on most leukocytes and plays a primary role in mediating initial leukocyte interaction with activated vascular endothelium (1). Human CD62L has signal transduction functions where engagement leads to increased calcium levels and upregulated expression of certain integrins (2). Antibody LAM1-116 recognizes the lectin binding domain of CD62L (2). Antibody LAM1-116 blocks CD62L function and induces expression of beta-1 and beta-2 integrins (1). (1). T.A. Springer, (1995) Annu Rev Physiol 57: 827-872. (2). D.A. Steeber, et al, (1997) J Immunol 159: 952-963. (3). Leukocyte Typing VI (T. Kishimoto, et al, eds.) Garland Publishing, Inc., New York (1997) p. 420-424.